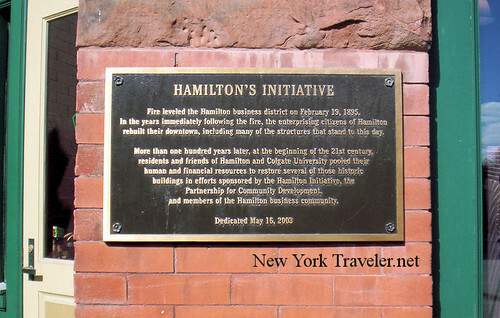 Hamilton, NY, is a small community in Madison County (Hamilton named for Alexander Hamilton, Madison County named for James Madison– we like the founding fathers up here!). It was incorporated as a village in 1813. 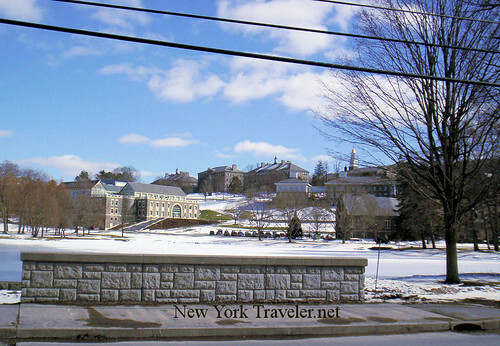 It is the home of the Ivy League college, Colgate University. 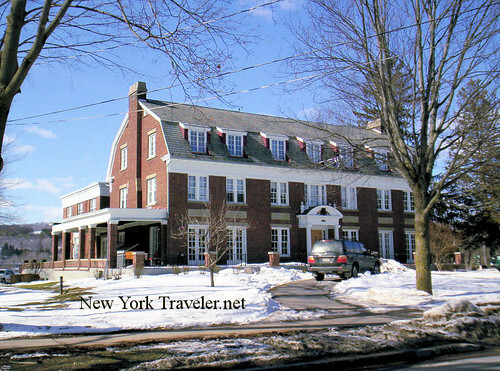 The presence of the college is everywhere– not just kids roaming the town, but the bookstores, restaurants, clothing stores, and elegant homes converted into frat houses are all geared toward making this town a “college town”; without which, Hamilton would be just another sleepy little farming community in Upstate New York. 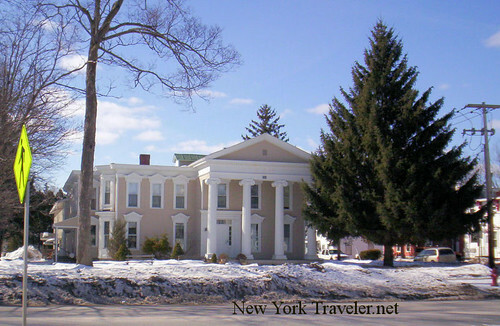 Colgate University was founded in 1819 as a Baptist seminary (most American colleges began as religious seminaries). 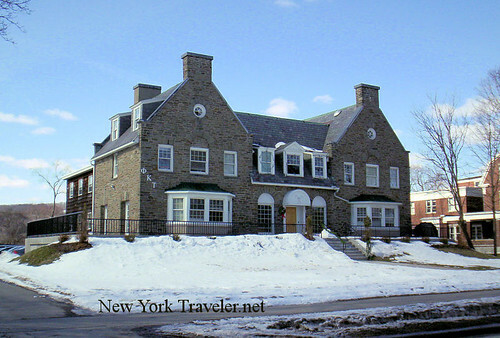 Colgate campus is very pretty- much of it sits on a hill. 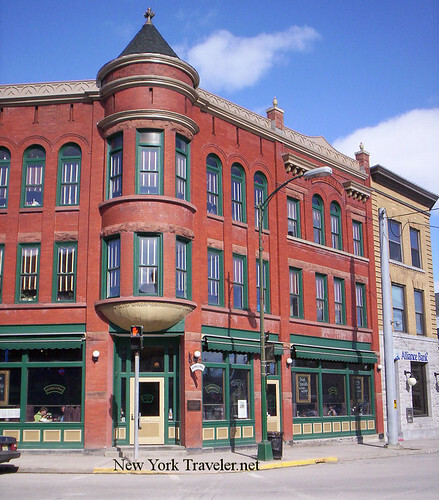 The buildings are stone which give it an old-timey, established feel. There’s a beautiful pond (it’s just beyond the stone bridge wall in the photo below) but it is frozen over right now. In the summer, white swans swim in it. In the photo above, you can barely make out the gold dome of what I think is the Colgate Memorial Chapel, one of the prettiest buildings in the cluster. Along the streets of Hamilton is some eye-popping architecture. Due to the college, the homes are kept up very well. 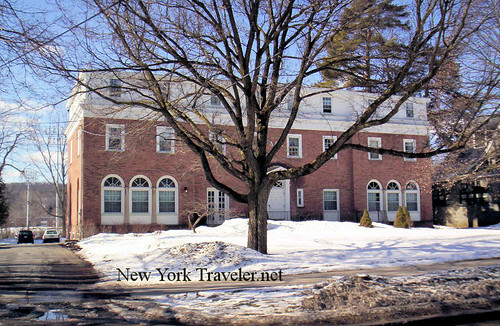 Here are some photos of the various fraternity houses there. 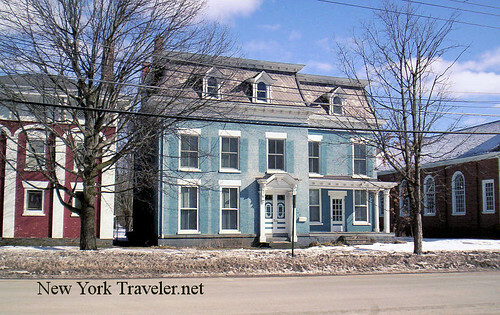 I just love this Greek Revival building. 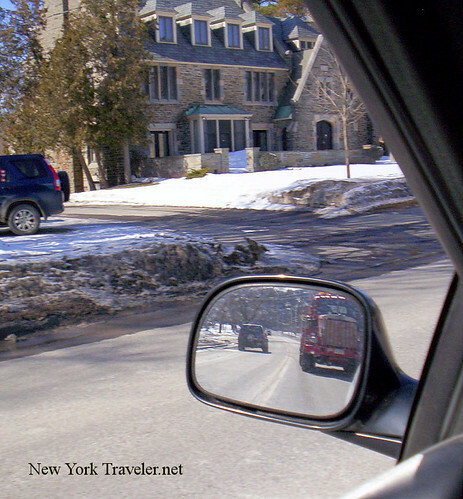 And here is a pushy tractor-trailer driver who thinks I’m driving too slow while I snap photos. Hamilton is a fun town to peruse. It has a distinctive, old-fashioned feel. You can see this by the style of the buildings. It really is a tidy, nice little village. 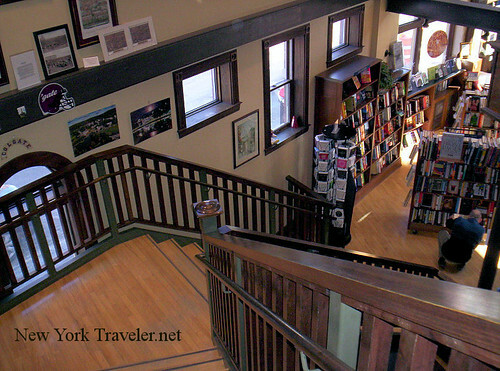 One of our favorite places to visit is the Hamilton library and bookstore. The library is stuffed with very old children’s books- including the Childhood Heroes of America books that schoolkids read in the 50s and 60s– and has a nice museum about the history of Hamilton. Unfortunately, the library was closed this day. We went to the bookstore instead. 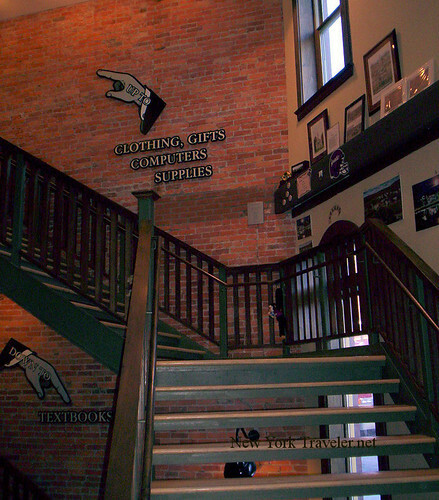 I think the bookstore used to be a warehouse? 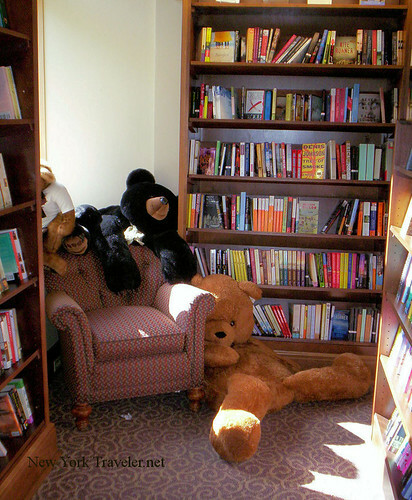 It is enormous, with squeaky old floorboards, warm nut-brown bookshelves, cubbies to explore, and areas to snuggle in the sunshine. 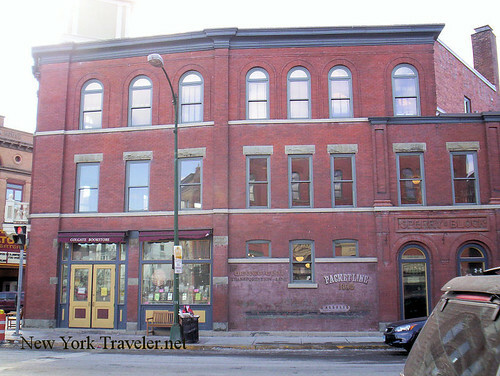 I’ll have another post with more photos I took, highlighting a few nice architectural details I saw on various places. 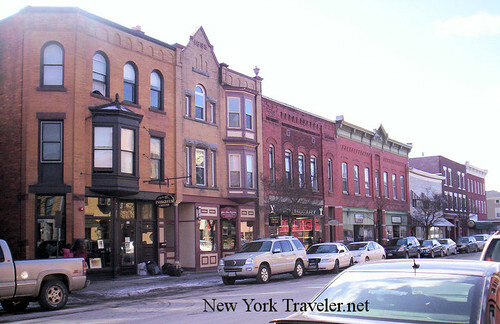 This was a nice little trip through a “quintessential” small-American town in New York State. I love the picture,I love the place. New York here I come! 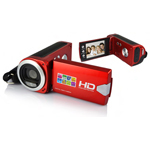 The photos are pristine and I enjoyed browsing made me feel like I was there. Beautiful photos! 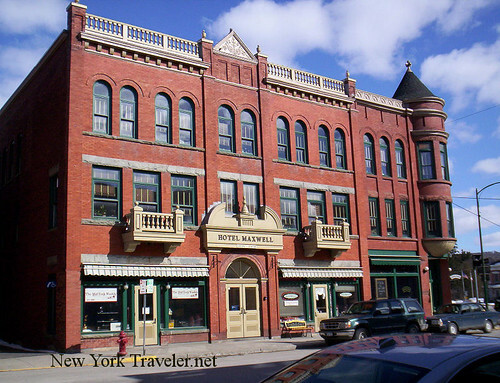 It looks like a comforting and welcoming town – somewhere with a bit slower of a pace than the big city.